I went to Texture Restaurant and Champagne Bar when it first opened in 2007. While I thought the food was good, I found it unremarkable for a fine dining restaurant. But since then, the word amongst foodie circles is that the food has evolved and is now fantastic. It also won a Michelin star last year, a fact which is also hard to ignore. The restaurant is a collaborative effort between Icelandic Head Chef Agnar Sverrisson, and sommelier Xavier Rousset who won the UK Sommelier of the Year award at the age of 22. The two met when working at Le Manoir Aux Quat’ Saisons. 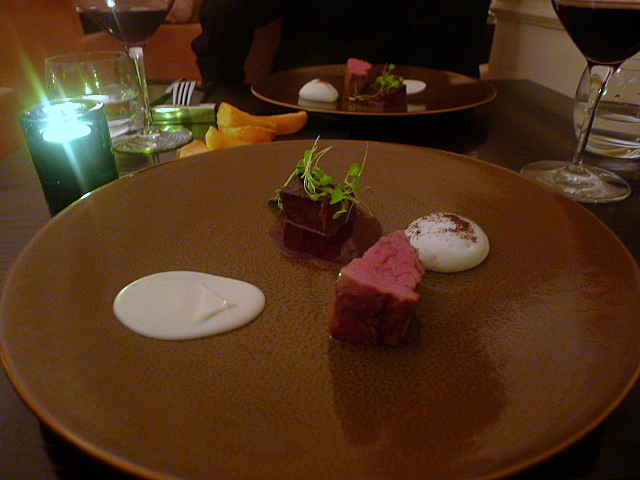 Sverrisson has also held positions at other notable restaurants such as Pétrus (under Marcus Wareing) and at the Michelin-starred Lea Linster in Luxembourg. 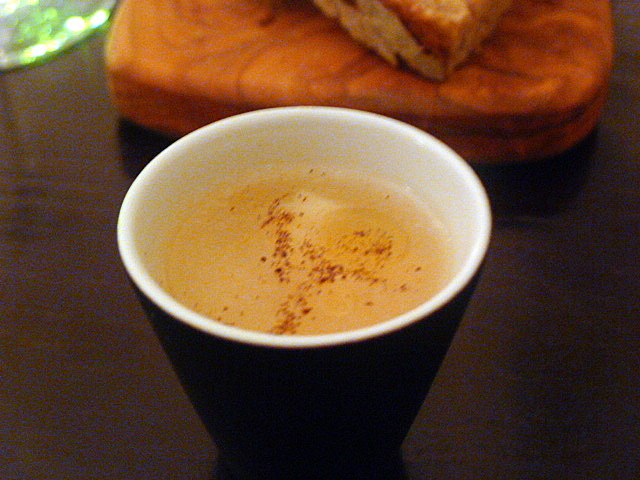 With his classic French training, the food at Texture is Modern European with an Icelandic influence. The look of the restaurant is also Icelandic cool, sleek and stylish. Texture also boasts of an impressive 88 bottle champagne collection, the day to day running of which is now maintained by sommelier, Erica, who was runner up in the Young Sommelier of the Year Competition. Xavier is still co-owner of Texture, but now spends more time at his other venture, 28-50 Wine Workshop and Kitchen. We selected the tasting menu for £68 (although on Texture’s website this is stated as £59). An appetiser of assorted diced vegetables with celery infusion and olive oil was stunning. 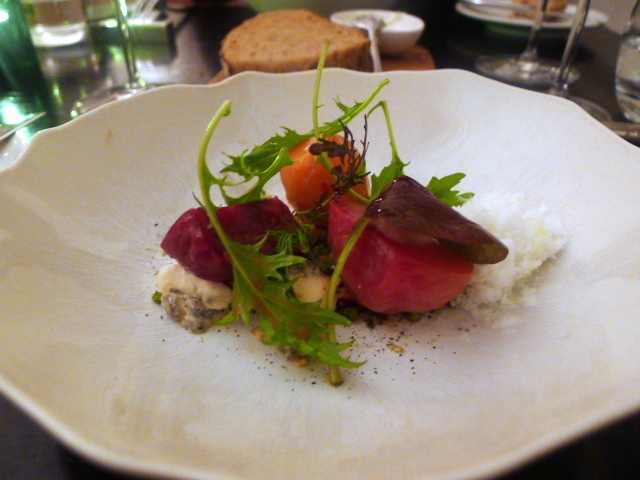 The flavour of the celery was delicate and light, and the tiny diced vegetables were perfectly cooked. Who knew an infusion made from celery could be so naturally sweet and tasty? English beetroot with goat’s cheese (yes that classic combination again) with oats and mizuna (Japanese mustard greens) was delightful. 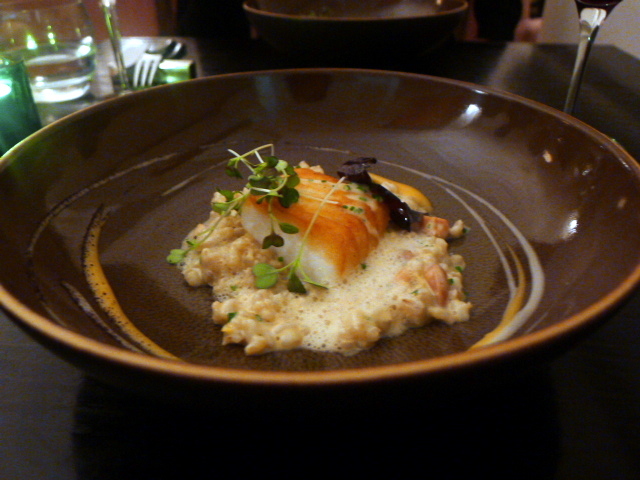 The finely chopped oats added a hint of crunch, and the mizuna gave the dish a lovely freshness. 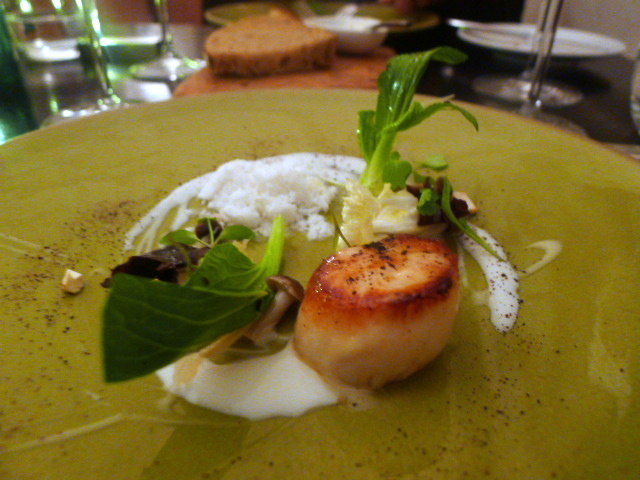 The two of us also ordered an additional dish from the à la carte menu to share, the Scottish scallops with coconut and ginger (£17.90). The photo you see below represents half a portion. The perfectly cooked scallop – crispy on the outside and opaque on the inside – had been finished with a touch of lemongrass, the effect of which was dazzling and fragrant. Finely chopped cashews had been added for a textural crunch, and the coldness of a coconut ice added a further contrasting touch. The coconut cream, rich yet subtle, provided a final flourish to this delicious dish. A perfectly cooked chargilled Anjou pigeon with red wine essence was tender and pink. 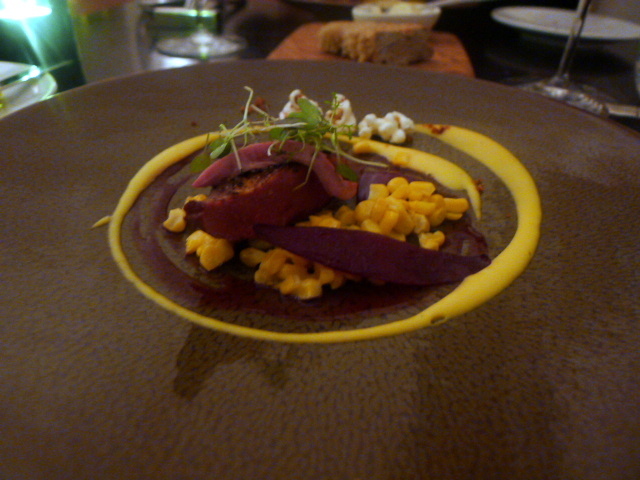 It was served with a sweetcorn purée which was lovely and sweet. It matched beautifully with the gaminess of the pigeon. Hints of seasoning came from the clever use of bacon powder, but there was also some bacon popcorn which seemed superfluous to the dish. Icelandic lightly salted cod was delicately cooked and moist. It was accompanied by a flavoursome shellfish jus and a barley risotto resplendent with soft, sweet pumpkin, and crunchy almonds and cashews. A pineapple purée completed the dish by providing a perfect hint of acidity to the fish. Sweet, tangy and light, this was a touch of magic on the plate. Grain fed rib-eye beef was served with chargrilled ox cheek, horseradish and olive oil béarnaise. The beef was moist and soft, and the tender beef cheek was robust with flavour. The béarnaise worked well with the richness of the meat. But the best aspect of this dish was the accompanying chips. Light and fluffy on the inside and super crunchy on the outside, they were some of the best chips that I have ever tasted. They were so good we had to ask for seconds. The bread on offer was a sourdough which was light and fluffy. The crust was fantastically crunchy – some of the best crust that I have ever eaten. Pre-dessert consisted of a lovely sorrel sorbet with a cinnamon and clove sabayon. Instead of the tasting menu dessert, we selected two alternative desserts from the à la carte menu. The first was an Icelandic inspired dish, a Valrhona white chocolate mousse with vanilla ice cream, dill and cucumber, finished with a drizzling of oat biscuits and white chocolate foam. 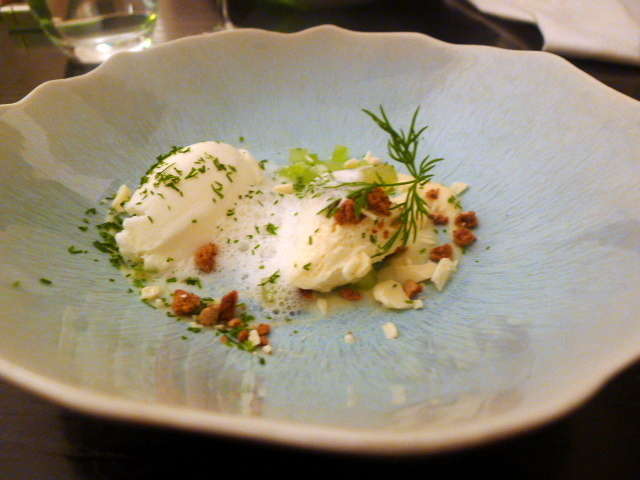 This dish was stunningly good and dazzled with the alpine freshness of the dill and cucumber. The creamy smoothness of the mousse was further accented by the crunchiness of the biscuits. The balance of flavours and textures were excellent. 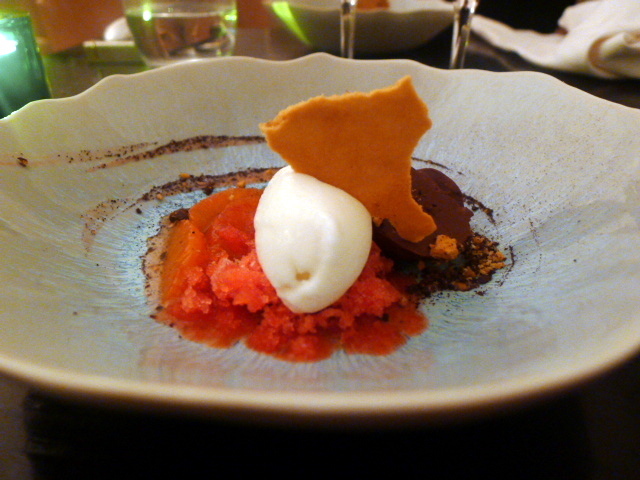 Our second dessert was a 55% Valrhona chocolate ganache with blood orange granite and segments. The chocolate was velvety smooth, but as it was quite rich in flavour, it slightly overpowered the gentle flavour of the blood orange. The service was knowledgeable and pleasant, but for a one star Michelin restaurant it should have been more polished. We were not poured our glass of dessert wine before our desserts arrived (we ended up having to remind the restaurant), and the service times between courses was uneven. I also pitied the confused-looking junior who approached our table with the appetisers ahead of schedule, only to be silently motioned away by the waiter who was talking to us at the time and then discretely led away by another. But none of these service incidents would detract me from going to Texture again. This was some fantastic cooking – classy, innovative and clever. Each dish abounded with textural contrasts and delighted with subtle hints of majestic flavours that tickled and tantalised our taste buds. This was a very impressive meal. What an incredible transformation from when it first opened. Price range: £68 for the tasting menu. £49 – £65 for three courses from the à la carte menu. There is also a reasonably priced set lunch menu with 2 courses for £19.50 and 3 courses £23.50. All prices listed here exclude drinks and service. Sounds like you had a much better experience second time around. Chargrilled Anjou pigeon is one of my all time favourites. I thought this meal was excellent! Sounds like another one to add to the list… meanwhile, am slightly kicking myself. Had a salad of roast beetroot and goat’s curd for dinner. Right next to it were the breakfast oats. Next time I’ll invite them to play too! Yes I really recommend a visit.